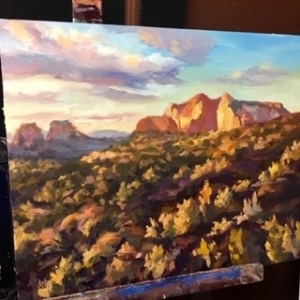 You are here: Home / Ans Taylors Art Blog / Uncategorized / Plein Air: Paint Outside! Why would I scramble over rock piles with my paint utensils strapped to my back at temperatures in the 30s instead of painting in the comfort of my studio? Do you know the feeling when you try to capture a breathtaking panorama with your camera, and to your disappointment the result is far less spectacular looking than the view you are actually looking at? Those moody looking blue mountains that line the horizon in beautiful shades of purple are barely even visible in the photo. Either the foreground is a dark lump, or the sky turns into a white out. And it never, never, captures the unique atmosphere of that moment. That’s because Photos lie: not only will the lens focus on simply everything in its visor, but also crank up the contrasts too high. Depending on the algorithm you are always losing more or less of the the mid tones. A photo is a great reference, but it can never replace the judgement of the artist on location, pondering which colors to use, how best to capture the light of the moment, which glows to enhance or dim down. And of course, there are a few other decisions best to be made right in the spot. Nobody would need that big traffic sign square in the middle of the beautiful panorama. The casita in the picture has also seen better times, and the jumble of bushes in the foreground just takes away from the actual subject. This is where the artist comes in, edits the components and changes the composition. This also allows for far better judgement with the wind in the face and the panorama lined up in 3D. 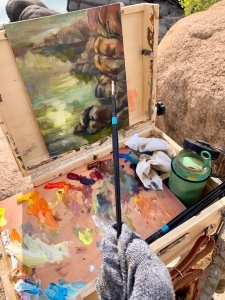 Plein Air painting means being subject to the elements of nature, from mosquitos to high winds (better be sure that easel is weighed down properly!) to rain and thunder, encounters with wildlife, sunburns and frozen finger tips. It’s meditative and overwhelmingly hectic at the same time, as decisions need to be taken before the shadows creep into another position. Yet, a morning alone on the rocks with only birds as audience, throwing color on the panel to capture the moment while chasing the ever changing light brings a satisfaction, that no studio session can replace. It reminds me of a Japanese tea ceremony saying: Ichi Go, Ichi E – ‘a once in a lifetime encounter’, or ‘Every moment only exists once in time, be sure not to miss the one present to you right now’. Capturing the beauties of famous Watson Lake in Prescott, AZ on a brisk November morning. https://www.anstaylor.com/wp-content/uploads/2018/11/pleinair2.jpg 666 1632 Ans Taylor /wp-content/uploads/2017/10/ans-taylor.jpg Ans Taylor2018-11-14 22:06:462019-04-16 20:53:02Plein Air: Paint Outside! We have a winner!! Enjoy a warm Copper Glow in the cold season!